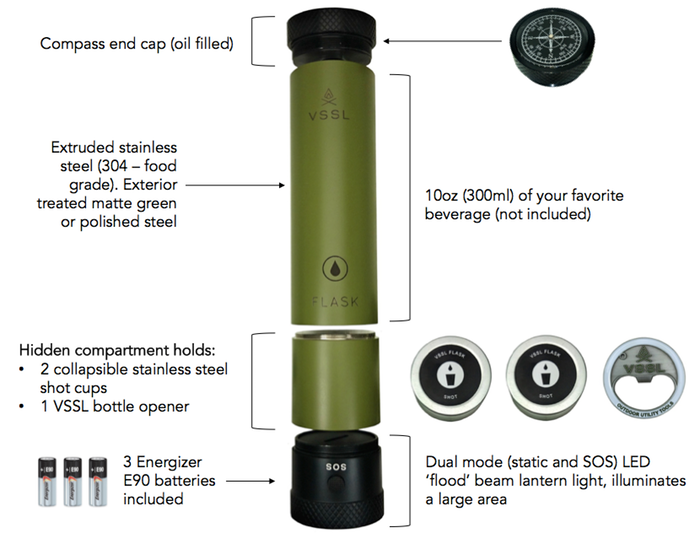 Last August, I wrote about the VSSL (pronounced like the word vessel), a hollow Aluminum tube for storing survival and outdoor items in, with an LED flashlight at the end; a bit like one of those old school large-sized Maglights, but with a hollow handle for storing items instead of batteries. Since then, VSSL has planed an expansion to their line of hollow body flashlights with the Flask Light. Made of food-grade stainless steel rather than the aluminum of the original VSSL flashlight, the Flask Light is a multi-compartment system which consists of a compass end cap, a 10 oz. liquid container, a hidden compartment with two collapsible shot glasses and a bottle opener, and of course the dual mode LED flashlight. The finalized VSSL Flash Light will be available with either a matte green or polished steel exterior. Back in August, we featured a product called the VSSL. It is an LED flashlight with a large handle that is used as a survival canister. 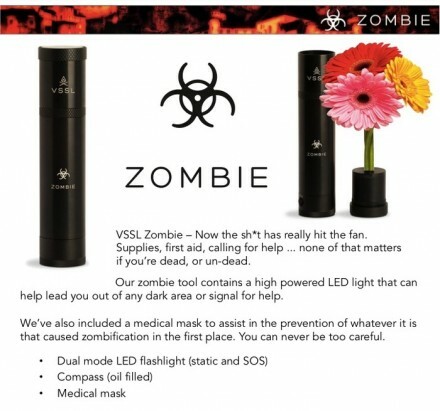 The Zombie VSSL features a black exterior, and comes with a dual mode LED flashlight, oil filled compass, surgical mask, and bouquet of flowers attachment head. Why (re)kill the undead when you can court them, right? The VSSL is a waterproof metal tube 8″ x 2″ made from milspec 6061 seamless extruded aluminum. Utilizing a high-powered LED light with a small form factor, the VSSL is essentially a flashlight with the extra handle space that once would be used to house the battery supply instead useable as a survival canister. The VSSL can either be purchased stand-alone, or ordered with one of three package configurations: Supplies, First Aid, and Shelter. The Supplies configuration, for example, features a vareity of survival tools, such as fire starters, fishing tackle, trail markers, and first aid, all bundled in individual tins custom fit to the VSSL. Made in Canada. Orders are expected to begin shipping Fall 2014.